Me: How was your day at school? What did you learn? Me: What did you do today at your soccer practice? Did you play? Teenager: Yes, but they definitely will bring it next time,- said he grinding his teeth, then asked: did you go to the gym today? Me: Yes, you know I go in the mornings. Why? Teenager: Can you drive me to the gym? Me, puzzled, and after the pause: "O...K... but didn't you just said that you are tiered after running 4,5 miles? Teenager: Yes, but we don't have to go right now, we can go in an hour. Me: Well, let me know in an hour and we'll go if you still want it,- thinking he would fell asleep, probably, first thing after he gets home. And he did, but not for the long: one hour later we were on our way to the gym. I already had my workout for the day, yet another mile or two wouldn't hurt, was my though, and teenager is tiered and we'll be out off the gym in 20-30 minutes. Little did I know... I run an extra 5 miles that day (in addition to my morning 3 miles run and a workout) while teenager was pumping iron to build his muscles, and... ready for this? I wasn't... run another 3 miles! Since then, we go to the gym almost every day, sometimes I make even two trips because I really love my morning yoga class. 1. Combine together the flour, polenta, baking powder, chia seeds, and salt and put aside. 2. Cream the butter and sugar (in the stand mixer fitted with the paddle attachment) until light and fluffy. 3. Scrape the bowl, and start adding the eggs and egg yolks, one at the time, mixing well after each addition. 4. Add vanilla extract, lemon juice and lemon zest, and mix well. 5. Add dry ingredients and mix on low speed until everything is incorporated, then add sunflower seed and give it a final mix. 6. Cower the bowl with the dough with the plastic wrap and refrigerate for 2 hours. 7. Preheat the oven to 325 F (165 C) and prepare two baking sheets: line it with parchment or oil it. 8. Flour your hands and place the dough on a well floured surface. Divide the dough in 3-4 equal portions and form long 10-12 inches logs and about 1 1/2 inch in diameter, and place them in the baking sheets, leaving a space between logs of 3 inches. 9. Glaze the logs with the egg white, and sprinkle with sugar (optional). 10. Bake logs for about 30 minutes or until it's golden brown. 11. Take the logs from the oven, let them cool. When it's cool enough to handle, slice biscotti with serrated knife on angle into 1/2 inch slices (or as thick as you like). 12. Place the slices in one layer on the baking sheet again, and bake in reduced to 200 F (95 C) for 30-35 minutes. Adjust the time if you cut your slices thinner. Do you have a baking story to share? What a cute conversation..Yikes I think you have loads of energy! I have never made biscotti w/ polenta..great idea! I could not possibly resist to these ones. I am a polenta addict. They have turned out perfectly. Well done! I've never had biscotti with polenta and have to try it. It sounds great! Sons are the best! I think the addition of polenta, seeds and lemon to biscotti sounds delicious. I like the reasoning behind why you have to bake and eat biscotti. Now I have to figure out a good reason for me to be able to eat them...I only walk 30 minutes a day. I dont remember when I had a cookie, but I lost 12 pounds in two month-)) I miss my biscotti with coffee, yours looks relish and healthy! Thank you for sharing interesting story, Marina. Your polenta biscotti looks yummy. Eaten with milk ... oh yes! Thankyou! They look divine and I have a big bag of polenta in the pantry and the kids have decided they don't like it warm so biscotti it shall be. I have never had biscotti made with polenta. What an awesome idea! I don't think I ever made Biscotties and polenta biscotties sounds great. A great treat for afternoon tea. Thanks for sharing. Sorry no story to share, my husband is the chef in our household. It was great to see the lovely china again. Thanks Lizzy! Oh, my energy is higher than a year ago but far from the teenager! :) Thank you for your kind comment. 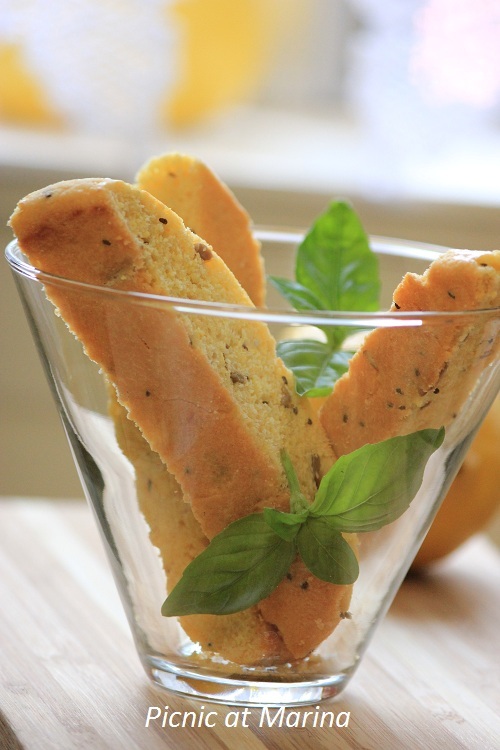 Marina, I loved reading your cute post about your teenager, and love, love the polenta biscotti! Your photos are supberb, as well! wow that is impressive!! I bet you were tired! :) Beautiful picture! 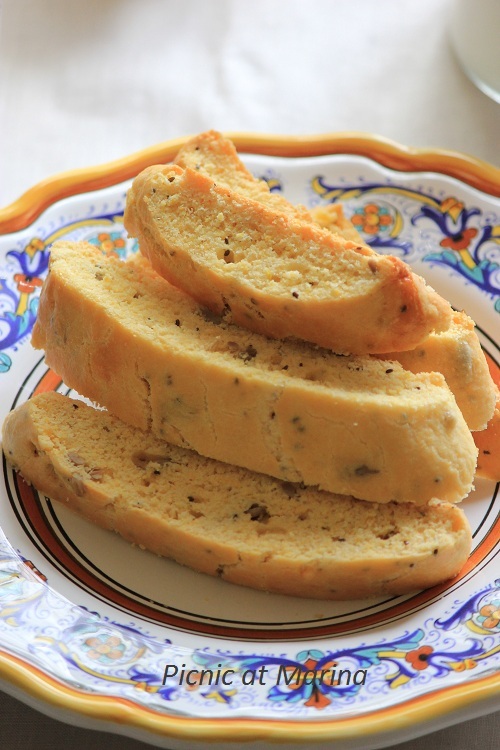 Polenta biscotti, that sounds interesting, must give a try. Absolutely stunning polenta biscotti. I recently had polenta citrus cookies for the first time and now fantasize about them, I bet I would love these just as much! That story is so cool, and the biscotti looks delicious! Great post! Seems teenagers have a never ending supply of energy! Fabulous biscotti! And where do they get it? We eat the same food, but have a way different level of energy! :) Thanks for your comment, Mandy! What a cute story! And that biscotti looks unreal! We were all that way at 16 - amazing, isn't it? You do a serious workout - I'm impressed. Mrs K R and I walk quite a bit, but usually only about 4 miles a day (plus another 30 to 60 minutes on an exercise bike). We don't pump iron (much) but we do pushups -fiendish things, but as one ages it's really necessary to retain some degree of fitness. Anyway, nice recipe. I love the flavor of polenta, but have never combined it with chia seeds - sounds like a terrific idea. Fun post - thank you. MMmmmm... I love polenta, and using it for a biscotti means it will last. What a marvelous idea for a breakfast item, sweet or savory. Good for you for doing the double work out.... a great outing for both of you. 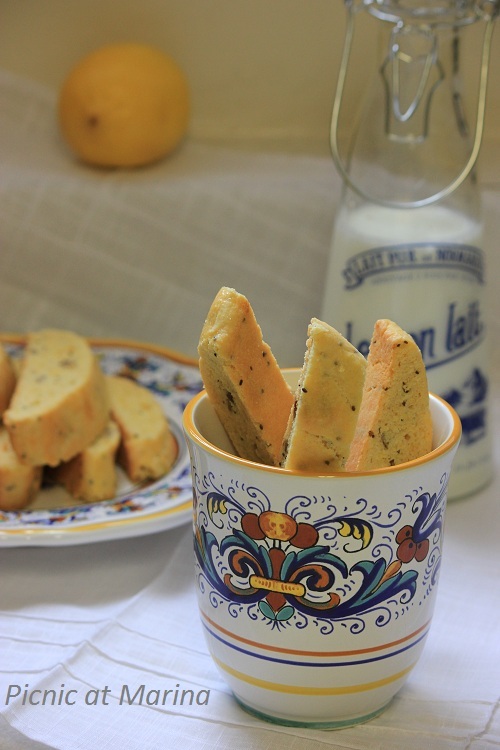 I've never had polenta biscotti but these look wonderful. I really love polenta biscotti, it's so crisp!!!!! I'm bookmarking your recipe! Have a nice week! Polenta in biscotti sounds really intruiging, it looks lovely. I am amazed too byt their stamina and strength Marina! My son is almost 10 and let me tell you he is like a tornado. He never stops. These biscotti would be perfect for him and for me, cause I need energy too, so as to run behind him! Such a fun age huh? I loved your story. And these biscotti! Thank you for sharing, my friend, and for making my day a bit more happy and delicious. I hope you are having a wonderful week! That recipe sounds wonderful! It's just what I always loved to eat when I ate more carbs. I never had to worry about carbs when I was younger...I've always been really active, too. My most interesting story would be....I had 4 teen aged sons at the same time. It's not wonder I was so thin back them! lol And I baked most of our bread. Enjoy your day....and your work outs! Oh Marina, you are funny! My kids are still 6 and 4, but I am preparing for teenage days by listening to other moms who have them. :) Boy I can't imagine how much I have to cook for them and all the activities I have to take to... As soon as my 4 year old goes full schedule at school, I'm going to join the gym and burn blogging fat! I like the idea of working out and baking more. I must do both in the next year or two! Your biscotti look delicious. So jealous you can eat them without hesitation. Haha. lol! He has way more energy than I did at that age. Still - good for him! So much better than spending the time curled up in front of the TV or something :) Fabulous looking biscotti too - you know, biscotti is something I STILL haven't made. Really need to give it a go!